The data from this analysis follows from Part I. The 2012 vote for Obama and Cantwell contained a much higher percentage of youth voters than the 2014 vote for the 42nd legislative seats. Whether these youth votes were suppressed, discouraged, or uninterested in voting for the Democrat candidates in 2014 is unknown. I will hazard this question: Satpal Sidhu did the best of the Democrat legislative candidates. He had the narrowest margin of loss. Was it because he was perceived as more pro business or more moderate? Or was it because he was a person color who attracted more young Hispanic and Native American votes? Or both? R Code is here. The table below shows six categories of votes by age for the Whatcom County 2014 General Election. Table entries 1 : 4 are only from ballots marked as "good". Undeliverables and Challenged ballots are part of categories 5 and 6. Note how the descriptive statistics for categories (1,2) of all of Whatcom County and the 42nd LD are equivalent and also for categories (3,4) which consist of good ballots from those who voted in each of the last three general elections. Both those populations are older by mean and median than categories (5,6) and their statistical equivalence as such is remarkable. 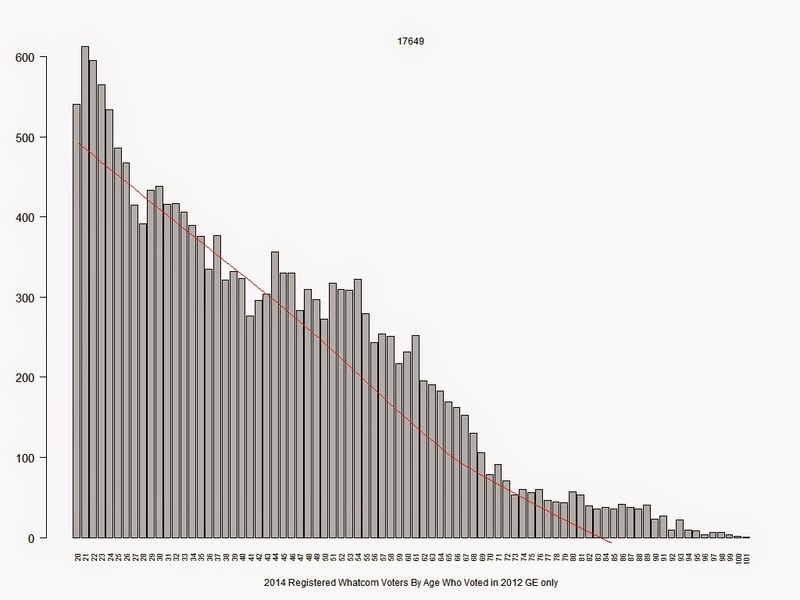 Those populations that voted only in 2012 (categories 5,6) but were still registered as of the 2014 GE have means and medians that show a much younger population. 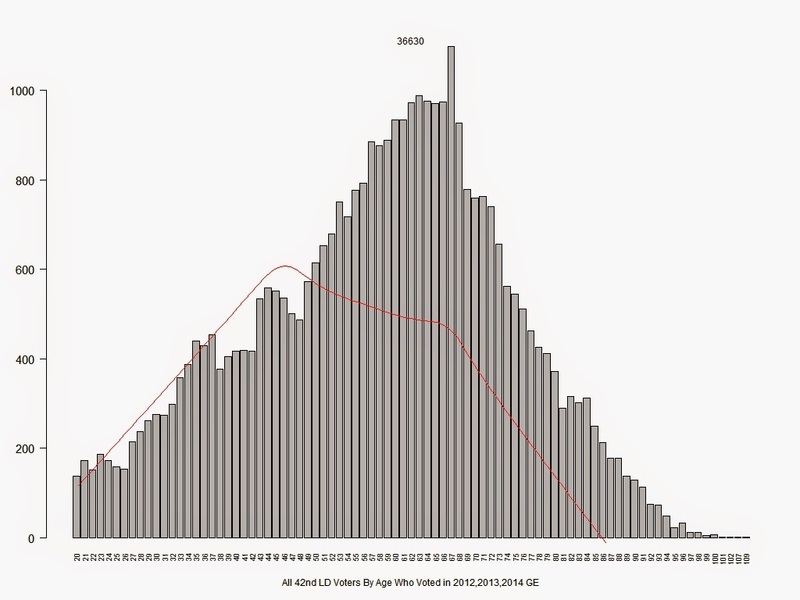 The last two graphs in this post confirm the youth of those non voting (or not counted!) populations in a visual manner that this table of descriptive statistics can not. The following two graphs show the age curves for all ballots marked as good for the entire county and the LD 42nd in the 2014 General Election. 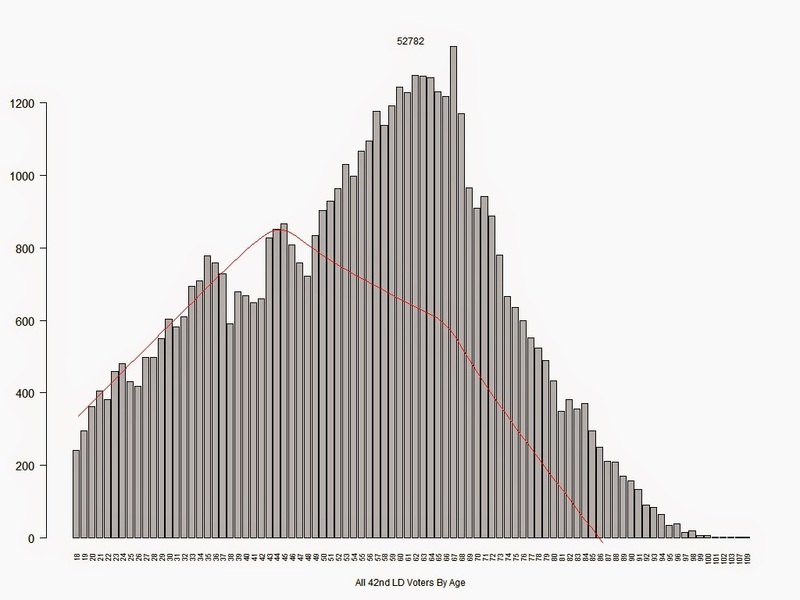 The graphs are nearly identical in shape and form and show the demographic dominance of a combined boomer/prewar (48 - 72 ?) "hump". 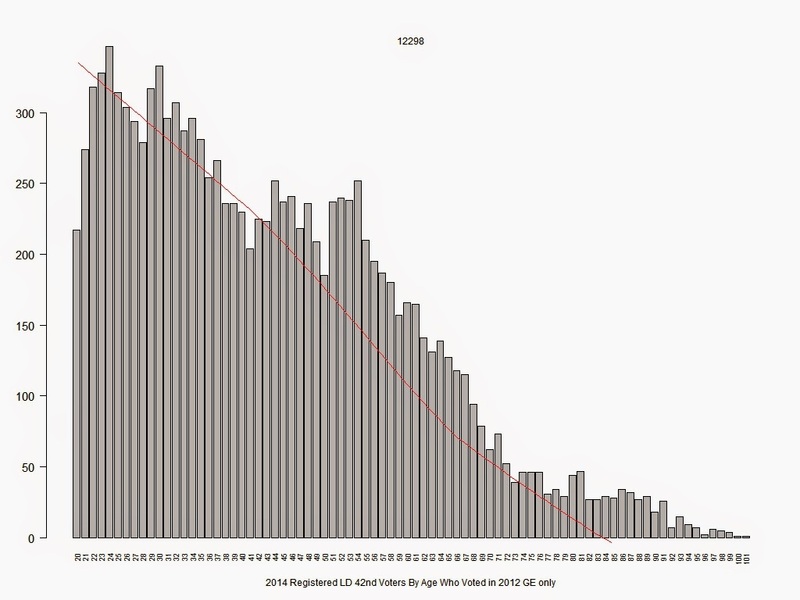 If we look at 2014 "good" ballots for just those populations that voted in each of the three of previous elections, we see the same demographic dominance of a combined boomer/prewar (48 - 72 ?) "hump". 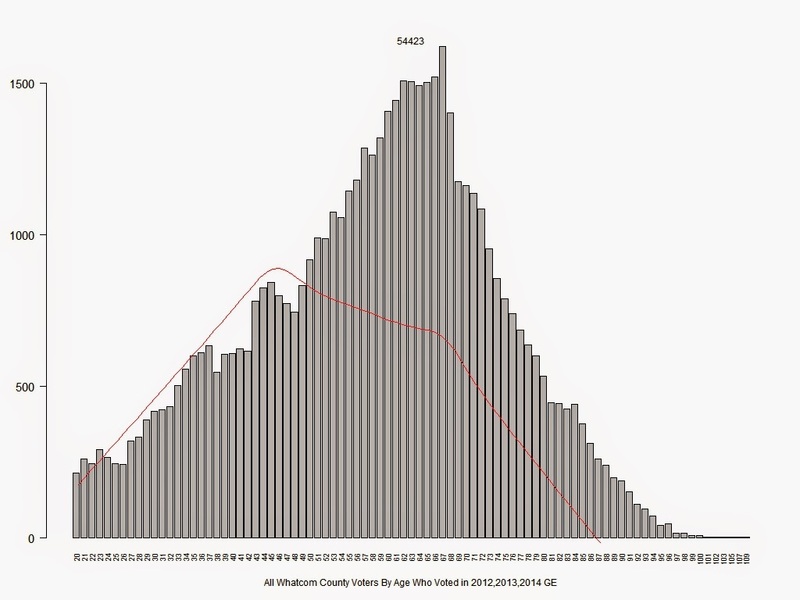 These populations are even older in mean and median than the all county, all 42nd 2014 votes.